Frank M. "Wildfire" Schulte (September 17, 1882 – October 2, 1949) was an American right fielder in Major League Baseball who played for the Chicago Cubs, Pittsburgh Pirates, Philadelphia Phillies, and Washington Senators from 1904 to 1918. He helped the Cubs win four National League (NL) championships and two World Series. In 1911, he won the NL Chalmer's Award. Schulte was born in Cochecton, New York, in 1882. He played independent baseball as a teenager, despite his father's opposition to the idea. From 1902 to 1904, he played for the New York State League's Syracuse Stars. He was purchased by the Chicago Cubs in August 1904. 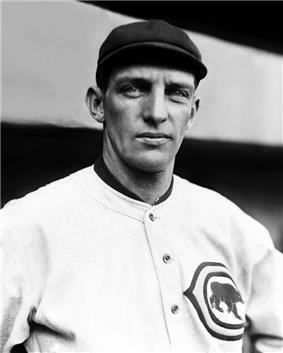 Schulte made his major league debut for the Cubs in September 1904. He played on the Cubs teams that won National League pennants in 1906, 1907, 1908, and 1910. They won the World Series in 1907 and 1908. In his four World Series appearances, Schulte had an overall batting average of .321. In 1910, Schulte led the NL with 10 home runs. In 1911, he led the NL in home runs (21), runs batted in (121), and slugging percentage (.534). He also became the first player in major league history to have more than 20 doubles, triples, home runs, and stolen bases in a season. The feat would not be accomplished again until Willie Mays did it in 1957. Schulte won the 1911 NL Chalmer's Award. In July 1916, Schulte was traded to the Pittsburgh Pirates. His hitting declined, and he then played for the Philadelphia Phillies and Washington Senators until the 1918 season, his last as a major leaguer. Schulte played in the International League and Pacific Coast League from 1919 to 1922. Schulte acquired his nickname, "Wildfire", after seeing a play called "Wildfire" in Mississippi. He then named one of his race horses "Wildfire" and was eventually known by that name, as well. Schulte married his wife, Mabel Kirby, in 1911. He eventually settled in Oakland, California, where he died in 1949. ^ a b c d e f Turner, Scott. "Frank Schulte". sabr.org. Retrieved February 1, 2013. ^ a b "Frank Schulte Statistics and History". baseball-reference.com. Retrieved February 1, 2013. ^ "Frank Schulte Minor League Statistics & History". baseball-reference.com. Retrieved February 1, 2013.